Guiding Question: How do you know what time it is if you look at an analog clock or watch? Procedure: Using chalk, draw one large clock for every 4-6 students. The clocks should be large enough for a student’s body to be each hand on the clock. Write the numbers on the appropriate spots or, if this is a review activity, have each group place the numbers on their own clock. Review the Creation story, focusing on the days and the eventual need to break days into hours. 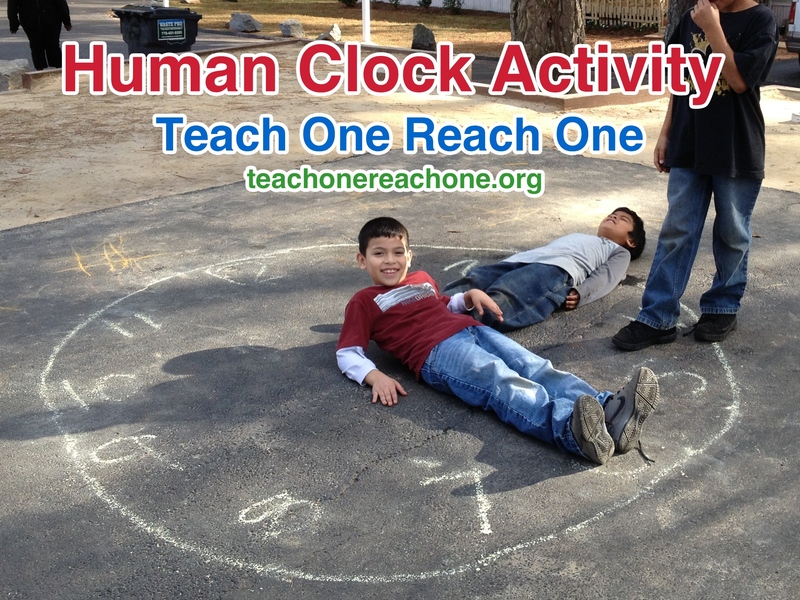 Teach or review how to tell time using an analog clock. Divide students into teams, with 4-6 students at each chalk clock. Then, call out a time. Two students from each team should race against the other teams to create the given time on their clock, using their bodies as hands, first. Play multiple rounds. How do people tell time using a 24 hour clock? How do you tell time with a sundial? Supplemental Activity: Build sundials with the students. Use them to tell time throughout the day.